The gift of choice is perhaps the most luxurious gift of all. With the Coach Gift card you select the perfect gift. The Coach card is redeemable online, by phone and at Coach stores in the United States, Puerto Rico and Canada. The Coach card may not be used at Coach Outlet Stores. Up to Three Coach gift cards can be combined for purchases on the Coach.com e commerce web site. There is no limit of the number of gift cards that can be used at Coach stores. 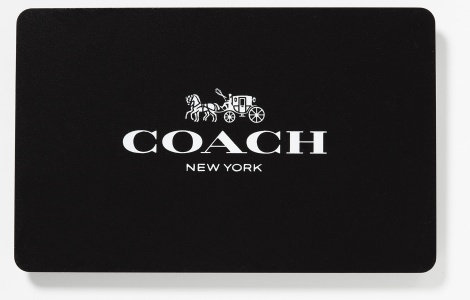 Coach gift cards have no expiration date. Coach gift cards should be treated like cash. Coach and its affiliates, resellers, and representatives are not responsible for lost or stolen gift cards. Coach gift cards may not be returned. Coach gift cards are not refundable or exchangeable for cash. If you buy more than what your Coach card is worth, then you will have to pay the balance with a credit card. Coach gift cards never expire. · The gift card may be redeemed for merchandise in any Coach Retail Store in the United States, Puerto Rico, Canada and Coach.com. · The gift card is not valid in Coach Outlet Stores, Department Stores, Airport Locations or Online at the Coach Outlet Website. · Returns of purchases using the gift card with be refunded using a merchandise credit.